Earth science generally recognizes 4 spheres, the lithosphere, the hydrosphere, the atmosphere, and the biosphere as correspondent to rocks, water, air, and life. Some scientiests include, as part of the spheres of the Earth, the cryosphere (corresponding to ice) as a distinct portion of the hydrosphere, as well as the pedosphere (corresponding to soil) as an active and intermixed sphere. Earth science (also known as geoscience, the geosciences or the Earth Sciences), is an all-embracing term for the sciences related to the planet Earth . There are four major disciplines in earth sciences, namely geography, geology, geophysics and geodesy. These major disciplines use physics, chemistry, biology, chronology and mathematics to build a qualitative and quantitative understanding of the principal areas or spheres of the Earth system. The Earth's crust, or Continental crust, is the outermost solid land surface of the planet, is chemically and mechanically different from underlying mantles, and has been generated largely by igneous processes in which magma (molten rock) cools and solidifies to form solid land. Plate tectonics, mountain ranges, volcanoes, and earthquakes are geological phenomena that can be explained in terms of energy transformations in the Earth's crust, and might be thought of as the process by which the earth resurfaces itself. Beneath the Earth's crust lies the mantle which is heated by the radioactive decay of heavy elements. The mantle is not quite solid and consists of magma which is in a state of semi-perpetual convection. This convection process causes the lithospheric plates to move, albeit slowly. The resulting process is known as plate tectonics. Volcanoes result primarily from the melting of subducted crust material. Crust material that is forced into the Asthenosphere melts, and some portion of the melted material becomes light enough to rise to the surface, giving birth to volcanoes! An ocean is a major body of saline water, and a component of the hydrosphere. Approximately 71% of the Earth's surface (an area of some 361 million square kilometers) is covered by ocean, a continuous body of water that is customarily divided into several principal oceans and smaller seas. More than half of this area is over 3,000 meters (9,800 ft) deep. Average oceanic salinity is around 35 parts per thousand (ppt) (3.5%), and nearly all seawater has a salinity in the range of 30 to 38 ppt. Though generally recognized as several 'separate' oceans, these waters comprise one global, interconnected body of salt water often referred to as the World Ocean or global ocean. This concept of a global ocean as a continuous body of water with relatively free interchange among its parts is of fundamental importance to oceanography. Macal River in Belize at San Ignacio, in November, 2001. The Lácar Lake is a lake of glacial origin in the province of Neuquén, Argentina. A river is a natural watercourse, usually freshwater, flowing toward an ocean, a lake, a sea or another river. In a few cases, a river simply flows into the ground or dries up completely before reaching another body of water. Small rivers may also be called by several other names, including stream, creek, brook, rivulet, and rill; there is no general rule that defines what can be called a river. Many names for small rivers are specific to geographic location; one example is Burn in Scotland and North-east England. Sometimes a river is said to be larger than a creek, but this is not always the case, due to vagueness in the language. A river is part of the hydrological cycle. Water within a river is generally collected from precipitation through surface runoff, groundwater recharge, springs, and the release of stored water in natural ice and snowpacks (i.e., from glaciers). A lake (from Latin lacus) is a terrain feature (or physical feature), a body of liquid on the surface of a world that is localized to the bottom of basin (another type of landform or terrain feature; that is, it is not global) and moves slowly if it moves at all. On Earth, a body of water is considered a lake when it is inland, not part of the ocean, is larger and deeper than a pond, and is fed by a river. The only world other than Earth known to harbor lakes is Titan, Saturn's largest moon, which has lakes of ethane, most likely mixed with methane. It is not known if Titan's lakes are fed by rivers, though Titan's surface is carved by numerous river beds. Natural lakes on Earth are generally found in mountainous areas, rift zones, and areas with ongoing or recent glaciation. Other lakes are found in endorheic basins or along the courses of mature rivers. In some parts of the world, there are many lakes because of chaotic drainage patterns left over from the last Ice Age. All lakes are temporary over geologic time scales, as they will slowly fill in with sediments or spill out of the basin containing them. Atmospheric gases scatter blue light more than other wavelengths, creating a blue halo when seen from space. 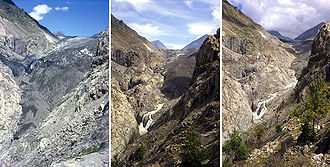 Another view of the Aletsch Glacier in the Swiss Alps, which due to global warming, has been decreasing. The United Nations Framework Convention Treaty and convention on Climate Change, to stabilize greenhouse gas concentrations in the atmosphere at a level that would prevent dangerous anthropogenic interference with the climate system. The Kyoto Protocol, which is the protocol to the international Framework Convention on Climate Change treaty, again with the objective of reducing greenhouse gases in an effort to prevent anthropogenic climate change. The Western Climate Initiative, to identify, evaluate, and implement collective and cooperative ways to reduce greenhouse gases in the region, focusing on a market-based cap-and-trade system. A greater degree of species or biological diversity - popularly referred to as Biodiversity - of an ecosystem may contribute to greater resilience of an ecosystem, because there are more species present at a location to respond to change and thus "absorb" or reduce its effects. This reduces the effect before the ecosystem's structure is fundamentally changed to a different state. This is not universally the case and there is no proven relationship between the species diversity of an ecosystem and its ability to provide goods and services on a sustainable level: Humid tropical forests produce very few goods and direct services and are extremely vulnerable to change, while many temperate forests readily grow back to their previous state of development within a lifetime after felling or a forest fire. Some grasslands have been sustainably exploited for thousands of years (Mongolia, Africa, European peat and mooreland communities). The term ecosystem can also pertain to human-made environments, such as human ecosystems and human-influenced ecosystems, and can describe any situation where there is relationship between living organisms and their environment. Fewer areas on the surface of the earth today exist free from human contact, although some genuine wilderness areas continue to exist without any forms of human intervention. Map of Terrestrial biomes classified by vegetation. The High Peaks Wilderness Area in the 6,000,000-acre (2,400,000 ha) Adirondack Park. Global biogeochemical cycles are critical to life, most notably those of water, oxygen, carbon, nitrogen and phosphorus. The nitrogen cycle is the biogeochemical cycle that describes the transformations of nitrogen and nitrogen-containing compounds in nature. It is a cycle which includes gaseous components. The water cycle, also known as the hydrologic cycle, describes the continuous movement of water on, above, and below the surface of the Earth. Since the water cycle is truly a "cycle," there is no beginning or end. Water can change states among liquid, vapor, and ice at various places in the water cycle. Although the balance of water on Earth remains fairly constant over time, individual water molecules can come and go. The oxygen cycle is the biogeochemical cycle that describes the movement of oxygen within and between its three main reservoirs: the atmosphere (air), the biosphere (living things), and the lithosphere (Earth's crust). The main driving factor of the oxygen cycle is photosynthesis, which is responsible for the modern Earth's atmosphere and life. Summer field in Belgium (Hamois). The blue flower is Centaurea cyanus and the red one a Papaver rhoeas. The establishment of nature and biosphere reserves under various types of protection; and, most generally, the protection of biodiversity and ecosystems upon which all human and other life on earth depends. Some of the biodiversity of a coral reef. ^ Earth's Spheres. ©1997-2000. Wheeling Jesuit University/NASA Classroom of the Future. Retrieved November 11, 2007. ^ USGS - U.S. Geological Survey - faqs, #17 What is the difference between mountain, hill, and peak; lake and pond; or river and creek? ^ Brittanica online. "Lake (physical feature)". http://www.britannica.com/EBchecked/topic/328083/lake. Retrieved 2008-06-25. "[a Lake is] any relatively large body of slowly moving or standing water that occupies an inland basin of appreciable size. Definitions that precisely distinguish lakes, ponds, swamps, and even rivers and other bodies of nonoceanic water are not well established. It may be said, however, that rivers and streams are relatively fast moving; marshes and swamps contain relatively large quantities of grasses, trees, or shrubs; and ponds are relatively small in comparison to lakes. Geologically defined, lakes are temporary bodies of water." ^ "[http://dictionary.reference.com/browse/lake a body of fresh or salt water of considerable size, surrounded by land. Dictionary.com definition]". http://dictionary.reference.com/browse/lake a body of fresh or salt water of considerable size, surrounded by land.. Retrieved 2008-06-25. ^ "Ideal Gases under Constant Volume, Constant Pressure, Constant Temperature, & Adiabatic Conditions". NASA. http://www.grc.nasa.gov/WWW/K-12/Numbers/Math/Mathematical_Thinking/ideal_gases_under_constant.htm. Retrieved 2007-01-07. ^ Pelletier, Jon D. (2002). "Natural variability of atmospheric temperatures and geomagnetic intensity over a wide range of time scales". Proceedings of the National Academy of Sciences 99: 2546–2553. doi:10.1073/pnas.022582599. PMID 11875208. ^ United Nations Framework Convention on Climate Change Retrieved August 2008. ^ Kyoto Protocol from United Nations Framework Convention on Climate Change, Retrieved August 2008. ^ Western Climate Initiative, Retrieved on Feb 12, 2009. ^ "Definition of Life". California Academy of Sciences. 2006. http://www.calacademy.org/exhibits/xtremelife/what_is_life.php. Retrieved 2007-01-07. ^ The figure "about one-half of one percent" takes into account the following (See, e.g., Leckie, Stephen (1999). "How Meat-centred Eating Patterns Affect Food Security and the Environment". For hunger-proof cities : sustainable urban food systems. Ottawa: International Development Research Centre. ISBN 0-88936-882-1. , which takes global average weight as 60 kg. ), the total human biomass is the average weight multiplied by the current human population of approximately 6.5 billion (see, e.g., "World Population Information". U.S. Census Bureau. http://www.census.gov/ipc/www/world.html. Retrieved September 28 2006. ): Assuming 60–70 kg to be the average human mass (approximately 130–150 lb on the average), an approximation of total global human mass of between 390 billion (390×109) and 455 billion kg (between 845 billion and 975 billion lb, or about 423 million-488 million short tons). The total biomass of all kinds on earth is estimated to be in excess of 6.8 x 1013 kg (75 billion short tons). By these calculations, the portion of total biomass accounted for by humans would be very roughly 0.6%. ^ Robert W. Christopherson (1996). Geosystems: An Introduction to Physical Geography. Prentice Hall Inc.
^ Smil, V. (2000). Cycles of Life. New York: Scientific American Library. ISBN 9780716750796. ^ *Flyvbjerg, Bent, Nils Bruzelius, and Werner Rothengatter, 2003. Megaprojects and Risk: An Anatomy of Ambition (Cambridge: Cambridge University Press). Adams, Simon; David Lambert (2006). Earth Science: An illustrated guide to science. New York NY 10001: Chelsea House. pp. 20. ISBN 0-8160-6164-5. "Earth's Energy Budget". Oklahoma Climatological Survey. 1996-2004. http://okfirst.mesonet.org/train/meteorology/EnergyBudget.html. Retrieved 2007-11-17. Simison, W. Brian (2007-02-05). "The mechanism behind plate tectonics". http://www.ucmp.berkeley.edu/geology/tecmech.html. Retrieved 2007-11-17. Smith, Gary A.; Aurora Pun (2006). How Does the Earth Work?. Upper Saddle River, NJ 07458: Pearson Prentice Hall. pp. 5. ISBN 0-13-034129-0.